Renewing your wedding vows? Congratulations! Since you may have chosen a vow renewal for any of a variety of reasons, you'll have to select the vows that meet your special needs. Many people write their own vows, emphasizing the reasons that they have chosen to "do it all over again." 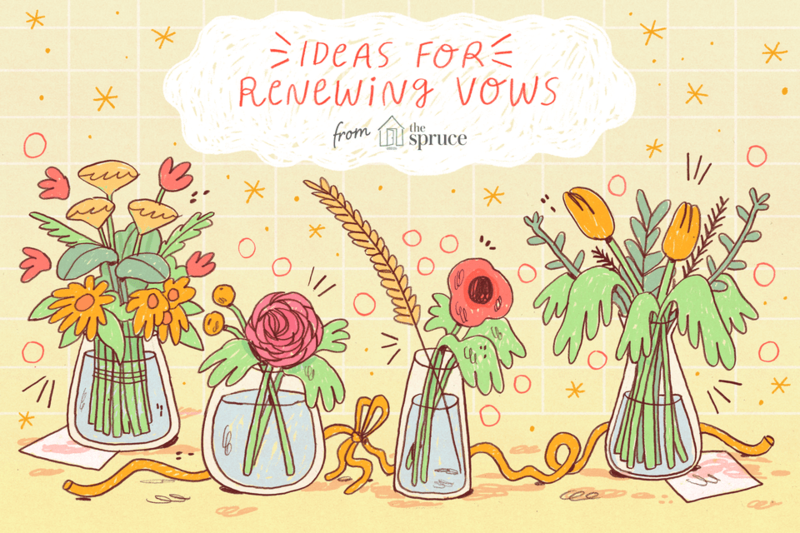 These sample vows can, of course, be personalized—but they're a great place to start. (Spouse's name), 25 years ago, I pledged my love and commitment to you, but it seems like only yesterday. I promised to love you, honor you, comfort and keep you. I pledged to be by your side in sickness and in health, in times of want, and times of plenty, for better or worse, for the rest of our lives. We have had all of those things, and you have been by my side as we created a family, a home, and a life together. Today, at the beginning of our 26th year as husband and wife, in the presence of God, and our family and friends, I renew my vows to you, pledging my eternal love for you, and eagerly awaiting what life may bring us. On our wedding day, I pledged many things to you, including my faithfulness. With great sorrow and regret, I acknowledge that I broke that vow but I realize now the enormity of my mistake. Others come and go, but you are the constant in my life whom I will always love. I believe in this marriage more than ever, and I reaffirm my love and commitment to you. On our wedding day, I pledged to love you in sickness and in health, and for better or worse. The past year has tested those vows, but our enduring love for one another has prevailed. I come here today to make a fresh start, to renew our vows of love, honor, and fidelity, and to reaffirm my love for you. Six years ago, I promised to love you for as long as we both should live. I never imagined that I would face the possibility of losing you so soon, or the depths of despair I would feel at that prospect. Today, we are on the other side of the mountain, and I am so ecstatic that I get to continue life's journey by your side. Once again, I promise to love you, honor you and keep you, for better or worse, in sickness and in health, for as long as we both shall live. With great joy, I pledged my love and commitment to you on our wedding day. But a loving relationship does not exist in a vacuum. Our family and friends first showed us how to love, helped us grow, and supported us when we found each other. I hope they will continue to love and support us as we love and support them. Therefore, I am delighted today, in the presence of these witnesses, to reaffirm my commitment to you, and once again, to promise to love you, honor you, and comfort you, in sickness and in health, for richer, for poorer, for better and for worse, as long as we both shall live. Typically the words you will say at a vow renewal are the same words you would say at any type of wedding. The officiant may make remarks about renewal, and any songs or readings may speak ​especially of lasting love or rebirth. Speak with your officiant about what is appropriate in your religion. What Are Some Thoughtful Wedding Vows Inspired by Dr. Seuss' Work? What Happens at a Commitment Ceremony?